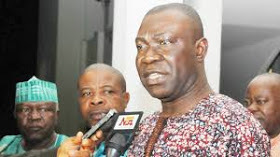 Ike Ekweremadu, the vice president of the Senate, said yesterday that the country would retreat if the use of smartphones was prohibited during the elections. He urged INEC to get involved, saying that even international observers need telephones and other devices to cover elections. The vice president of the Senate made this known during a condolence visit to Bayelsa state governor Seriake Dickson at his country house in Toru-Orua following the death of his 72-year-old mother, Mrs. Goldcoast Dickson. "Nigeria must take full advantage of technology, as it can not afford to be left behind, especially in the bid to guarantee the participation of citizens through the registration of results and electoral processes. "International observers would need their smartphones and other multimedia devices to register and send information to their countries of origin. "On the issue of the prohibition of smartphones at INEC's polling stations, this is completely unconstitutional because we have provisions in the Constitution that allow for freedom of communication, expression and even press freedom. Prohibition is trying to reduce. "Nigerians are free to express themselves through the media and freedom of expression, I believe that in this age of technology, we can not go back, so we must make the most of the achievements of technology in our lives." He added that "we are amending the Electoral Law to foresee the announcement of results in the voting centers and if our people can not communicate, it does not make any sense, we hope we can achieve a free, fair and credible election through the use of technology" .